Saturday, October 17th, 2015, 4:00pm. Taken at State and Main, the center of downtown Rockford, facing Northeast. What’s missing? Signs of life. Pedestrians. Shoppers. Even motorists were slim to none at this time. A City with a population of 150,000 should see a fair amount of traffic within its urban core on a weekend. Yet this lack of pedestrian activity is, unfortunately, quite common, even on weekends. Where is everyone? Saturday, December 9th, 1944. Taken by Bob Anderson at State and Main, the center of downtown Rockford, facing Northeast. What do you see? Signs of life. Look at all the people! There are 40-50 pedestrians pictured in just this block alone, not to mention the motorists on the street, and the shoppers within the stores. What made this place work? "Just how I knew and loved it! And will always think of it this way + a very few changes! But, it was sooo great in these years!" These comments accompany various posts on the Rockford Reminisce Facebook page. 1: On the first floor of every building pictured: The lights are on, and retail is open for business. We’d kill to have this degree of commercial occupancy and retail traffic today. Also worth noting: If the adage ‘Retail follows Rooftops’ is true, one can assume that most of these people lived downtown, or in one of the adjacent neighborhoods. 2: This place does not cater to the automobile. No parking decks. No surface lots. No 12-foot lanes. And check out how small the traffic signs are; it suggests that traffic is going at a speed slow enough to view them. 3: We had transit! To be sure, we had a streetcar system just twenty years earlier than this photo was taken. Even twenty years later, however, we had an electric bus taking residents to Harlem Boulevard, the main street of the Churchill’s Grove neighborhood just one mile north of this location. 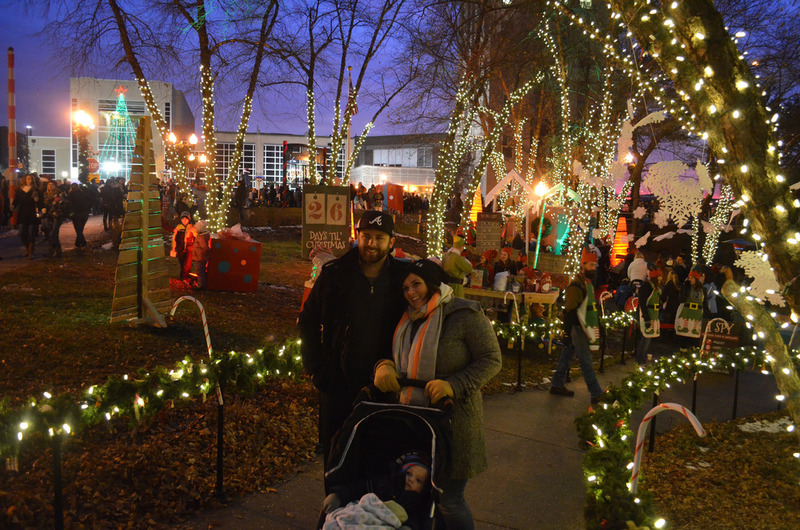 For the past two years, the Rockford Area Convention and Visitors Bureau has hosted Stroll on State, a holiday event including live music, traditional activities writ large (e.g. lighting a massive spruce tree downtown), and, of course, retail. Last year, 60,000 people attended Stroll on State. 60,000 people. And this year's is expected to bring just as many people. Needless to say, the event has been wildly successful. I don’t bemoan RACVB and Stroll on State. It’s great. We’ve attended both years, and we’ll be there this year. But Stroll on State is ‘spectacular’ in every sense of the word. It’s extra-ordinary. So what does ‘ordinary’ shopping look like in Rockford? This is Cherryvale Mall, located in the suburban (for all intents and purposes) town of Cherry Valley, nine miles from State and Main in Rockford. It’s normal for people to shop here; it has been for many years. Let me ask: How much does it cost to build and maintain all the infrastructure needed to drive to Cherryvale Mall? What will happen to this place in the next 15-30 years? How does a place like this adapt and evolve over time? I should mention that there are signs of life not pictured here. Kryptonite, District, Octane, and Kortmans, not to mention the Stewart Square businesses. Also note the improved streetscape; these sidewalks are wider than the ones pictured in Bob’s photo. And, while we there are two unfortunate parking decks nearby (or three, or four, depending on how far you go), our building stock remains intact. As we speak, the Trust building pictured above is being rehabbed with 63 market-rate apartments going in. Those future tenants will be ready to shop, and we’ll have spaces ready for retail. These buildings have remained standing for nearly 100 years; if we play our cards right, we can give them the signs of life needed for the next 100 years. Can the same be said of Cherryvale Mall? PS: Catch a glimpse of our fair City’s past through Bob Anderson’s Flickr page. They are excellent.